Like millions of others at this time of year, I intend to embrace healthier food choices and habits in 2019. What better place to start, than breakfast; the most important meal of the day. We all know how important a good breakfast is to our overall health. However, have you noticed how unhealthy many of our go-to breakfasts are? Cereals are low in nutrients, and often high in sugar and carbs, which spike your blood sugar and do not sustain you. Pastries, well, you do not need me to point out that muffins and waffles and bagels are not exactly the poster children of healthy breakfasts, even when they are made with ingredients such as chia and flaxseed. Yogurt, the easiest grab-and-go breakfast, requires a ton of time reading labels to find the ones that aren’t loaded with sugar. The fact that there is not a lot of time in the morning to make breakfast adds another challenge to achieving that healthy start. Keep frozen fruit and kale in your freezer for smoothies. Know what you are going to make for breakfast when you go to bed; this saves time in the morning when every minute counts. Have chia seeds, organic eggs, rolled oats, agave, spinach, feta, nitrate-free Applegate Sunday bacon, Ezekiel bread, avocado, cinnamon, fresh fruit (always include bananas), Thomas’ English Muffins, sweet potatoes, plain yogurt, and healthy granola on hand. six-minute soft-boiled eggs cracked over buttered, toasted English muffins and served with fresh fruit; Avocado toast with Ezekiel bread, sprinkled with chia seeds and drizzled with lemon juice; Overnight oats with chia seeds, cinnamon, and bananas; smoothies using coconut water, banana, kale, and any other frozen fruit; scrambled eggs or an omelette with spinach and feta; and yogurt parfait with fresh berries and granola. 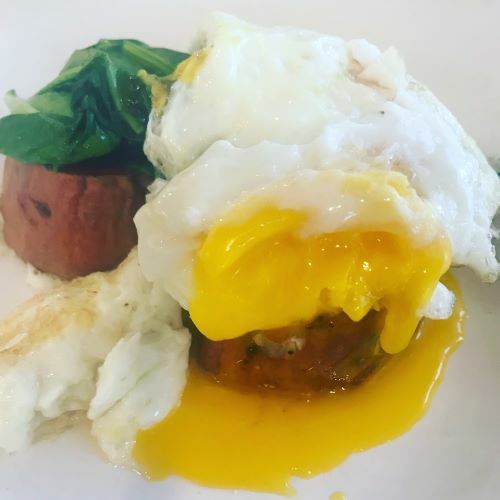 My newest, favorite breakfast has a sweet potato round, instead of bread, on the base of my usual poached egg, which packs it with extra nutrients. I found it in the “Whole 30 Cookbook” and it is so satisfying. I recommend slicing and cooking the whole sweet potato, even if that yields more rounds than you need, because the leftovers make for great snacks later in the day. If you are super-organized, cook the bacon the night before and reheat in the pan when you are cooking the sweet potato. If you don’t have time to cook the bacon in the morning, you can enjoy this dish without it (as is pictured). Good luck starting your day (and year) on a healthy note! Heat 1 tablespoon of oil in a large skillet over medium heat. Add the sweet potato rounds in a single layer and cook until fork-tender and browned on both sides, 3 to 5 minutes per side. Remove the sweet potatoes from the skillet and sprinkle with 1/8 teaspoon of the salt and 1/8 teaspoon of the pepper. Add the remaining 1 tablespoon of oil to the pan. Add the garlic and cook stirring, until fragrant, about 30 seconds. Before garlic turns brown, add the spinach and cook, stirring until wilted, about 1 minute. Sprinkle with the remaining salt and pepper. Meanwhile, fill a wide skillet with water and bring to a boil over high heat. Gently crack and slide each egg into the water in its own area. Eggs should be completely submerged in the water, but if not, with a spoon, gently push water over the top of the eggs so it poaches the yolk. Cook for approximately 3 minutes or until the whites look cooked through. On each plate, top the sweet potato rounds with spinach, bacon, and one egg.